The bells at St James date back to 1877 (see History of St James Bells), and the bells were installed at louvre level in the tower. This means that the prevailing westerly winds blow rain and salt through the openings and all over the bells. The last major work to the bells took place in 1924 when they were re-hung on new ball-bearings. Over the years since 1924 the bells and all the associated metalwork (bolts, straps, bearings etc.) have corroded badly, and the condition of the wooden wheels and timber bell frame has deteriorated. The clergy, congregation, and community at large, managed to secure the long term future of the Grade II* listed Church building by raising sufficient funds to address the immediate problems with the fabric of the building. 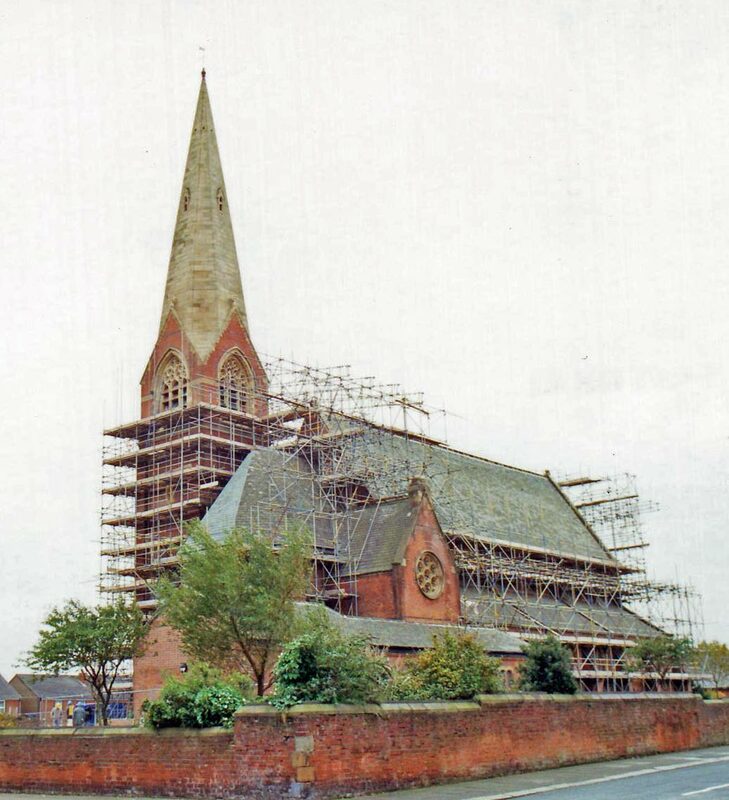 In 1999, the Church began extensive work to repair and replace the roof, west window, the tower, sandstone doorways and other masonry. The bells could not be rung while this work was underway (especially during work to the tower), and this turned out to be the last time the bells were rung together for 14 years. Regrettably, an inspection of the bells around this period revealed that the condition of the bells had deteriorated to the extent that several of the bells were not really safe to be rung in the traditional way (see introduction to ringing). The bells exert considerable force as they swing - as much as 4 times their weight (St James bells weigh between 267kg and 800kg each) and these forces are normally handled comfortably by a well maintained installation. However the bells at St James need some substantial repairs to the bell fixtures and to the frame before they can be rung safely once again. There was no money available to restore the bells at that time, because all the funds had/were being used to repair the fabric of the church. So a single bell was made fit to swing chime (much less force), and this ensured that a bell could be tolled before Sunday and funeral services. Sadly this has meant that the other 7 bells have not been rung properly since then, and with little prospect of them being rung for many years. When his son moved to Barrow-in-Furness to work in BAE SYSTEMS in 2008, Geoff Pullin from Daventry discovered that the bells at St James were out of action, and he set about trying to organise basic repairs, with the blessing of the Vicar and PCC (parochial church council). When long serving tower captain Jack Bagnall died in 2009, an obituary in the Ringing World newspaper led to another accomplished bellringer stepping in to help. This time it was Dennis Ellisdon who now lives in Ilford, but who learnt how to ring on the bells of St James, back in about 1960. Dennis generously pledged a substantial sum towards a much more thorough and long term restoration (rather than short term repairs). And so the foundation for this appeal was put in place. A number of options were considered for the restoration project (from 'patch up' temporary repair, through to the longest term solution involving re-hanging the bells lower in the tower). Several bell hangers and founders were invited to quote for each option, and to compete/tender for the project. In the end there was a clear favourite which offered a long term solution, that was competitively priced, and was unanimously supported by the St James PCC and vicar. Greater protection from the weather, reducing corrosion and maintenance, and extending the life of the bells. Improved sound control, so that the bells are not quite as loud in the immediate vicinity of the church, but can still be heard across the town. Improved ease of handling for the ringers. The old position of the bells meant long ropes, which can be more difficult to ring. The new position of the bells will mean shorter ropes, making ringing easier and safer, and will be especially helpful for younger ringers learning to ring, or inexperienced visiting ringers. Less stress to the tower during ringing. The swinging bells create lateral forces on the tower, so the tower can sway a small amount as a result. Placing the bells lower in the tower will reduce the sway of the tower. Some alterations to the floor arrangement will be necessary. Central part of floor in the belfry under the old bell frame will be removed and replaced with a metal mesh floor that will (a) allow sound to reach louvers relatively unimpeded, and (b) provide ability to cover to control sound during extended ringing such as peals, and (c) permit safe viewing from above, even when the bells are being rung! An additional floor will be fitted with 2 inch thick boards half way up the ringing room, providing rope guides and acceptable sound reduction (bells will be closer to the ringers), and provide a physical barrier to protect the ringers from any unlikely event such as a clapper falling out or other calamity. The Chancellor of the Exchequer announced plans in Budget 2012 to remove the current VAT relief on approved alterations to listed buildings adding 20% overnight! The problem of rainwater blowing in through the louvers and masonry piercework above the louvers was a real concern, and was dramatically experienced by visitors at the beginning of our tower open day in June 2012. It is essential to protect the bells along with the new frame and fittings, from as much of this weather as possible so that they will last a great many years with the minimum of maintenance. Addition of weather protection in the form of Galebreaker Bayscreen® tensioned mesh panels behind all louvres and tracery would be installed to catch the quantity of wind and spray that got into the tower, and keep it away from the bells. The quantity of the water ingress over the years had rotted floors of belfry and intermediate room, and also rotted the main foundation beams of the belfry, requiring replacing of more floors, and adding a substantial support beam underneath the unrotten part of the belfry beams. There was more extensive electrical work, plus extra requirements to qualify for certain grants to provide live video feed for people with mobility difficulties to see the restored bells from the ground floor of the church, and souvenir order of service for the rededication. A handrail to the ringing rooom and a carpet in the ringing room were covered by individual donations, and the refurbishment & redecoration of the ringing room and new belfry were covered by the proceeds from the hand crafted wooden items made from the old bell fram, wheelsm, headstocks, stays and sliders. 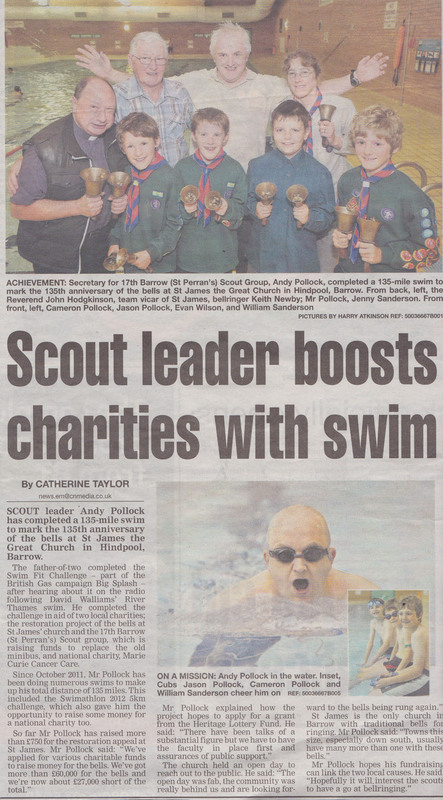 Sponsored Swim - NW Evening mail article and details of swim. At the start of the appeal, the cost of the project was estimated at just under £80,000. The Budget 2012 plans to remove the current VAT relief on approved alterations to listed buildings, increased the fundraising burden by another £16,000 to nearly £100,000, and all further costs by an additional 20%. With all the other additional costs and work outlined above, the project costs have risen to over £166,000, but this is reduced by volunteer labour, pledges received, and grants that have been secured or are confident of receiving. After fundraising for several years, and astonishing generosity from individuals and charitable organisatons had managed to raise or pledge almost £80,000 towards the project. The project had a breakthrough at the end of March 2013, when the Heritage Lottery Fund awarded a fantastic sum of £74,400, which should fund the shortfall in funds to meet the building and bell restoration costs. Refit all the bells with all new fittings into the frame. These figures from 2013 after sum of £170 has already been paid from the Bells Appeal Account for the Carlisle Diocese Faculty Application Fee. CDM = "Construction Design and Management"; HLF = "Heritage Lottery Fund"
There were still some fundraising activities, and more grant applications to come to meet any further increases in costs. What a great pity that couples getting married can only have a single chimed bell, when the church has a ring of 8 bells that could ring out in celebration if they are restored. The bells at St James are part of the heritage of Barrow-in-Furness. The original bell was a gift from the founding visionaries of Barrow-in-Furness (Ramsden, Cavendish, Buccleuch, Schneider) - more information, and was replaced by the current ring of bells that were installed through public subscription in 1877. It would be a great shame if the bells were to languish silently in the tower, when they could ring out across Barrow-in-Furness and connect the listener today with all those people who have heard the bells over the years. St James has the only ring of bells in the whole of Barrow-in-Furness that are hung for the traditional style of bellringing. Neighbouring towns and villages of Dalton-in-Furness, Great Urswick, Ulverston, Kirkby-in-Furness, and Broughton-in-Furness, all have bells that can be rung. If neighbouring towns can ring church bells, why can't Barrow-in-Furness? The social and hobby aspects of ringing bells have been missing for the last 13 years. Weekly bellringing practices can offer an opportunity for people young and old to mix socially and gain mutual respect for each other. When the bells are restored, there will be an opportunity for anyone to come along and enjoy ringing together, whatever their race, gender, beliefs, etc. After 6 months of activity from mid-July 2013 to end of January 2014, the bells were finally able to be rung together on 29th January 2014 for the first time in 15 years! The bells are now installed in the tower, and the re-dedication service led by the Bishop of Carlisle on Sunday 9th March was brilliant. The job of raising money to restore the bells is now done, but that is not the end... we need to recruit new reingers, and we need to continue to raise money for annual running costs (heating and lighting), maintenance of the bells (e.g. spare parts, fixing noise from headstock), and improvements (e.g. sound control improvements, extend handrail). All donations and assistance will be most welcome. More information about how to donate, or support fundraising through purchase of woodturned items for sale, is available on the fundraising page.